Gifts can include anything of religious significance and are usually presented to the child on the day of the Communion. Whether from the child's Godparents, Grandparents, or parents, many people choose a keepsake gift that can be with them forever. 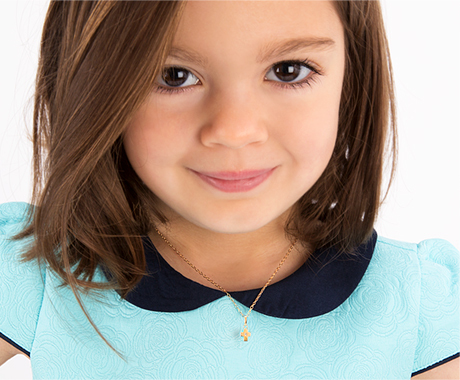 Jewelry makes for a good keepsake gift because it is made of precious metals (the child is precious), can be personalized with initials, name, or monogram, and bracelets can be adjusted in size as the child grows. Rings may also be resized by a local jeweler or added to a silver or gold chain as a keepsake necklace. Gold earrings also make a great First Communion gift as they can be worn into adulthood, as long as they are a simple and classic design. Holy Communion is the receiving of Jesus Christ in the sacrament of the Holy Eucharist. To receive Holy Communion worthily it is necessary to be free from mortal sin, to have a right intention and to obey the Church's laws on the fast required before Holy Communion out of reverence for the body and blood of Our Divine Lord. We should prepare ourselves for Holy Communion by thinking of Our Divine Redeemer whom we are about to receive, and by making fervent acts of faith, hope, love, and contrition. Special Clothes are Worn at a Holy Communion. One usually wears specific clothing, nearly always white to signify purity, which may include robes, gowns, veils, or white pants and shirt. This same type of clothing has been worn earlier for Christenings or Baptisms as well as later in their spiritual progression for the child's following communions and wedding day. Through the Eucharistic celebration Christians remember Christ's sacrifice of himself on the cross. Just as it is necessary to nourish our bodies with material food, so also it is necessary to nourish our souls with spiritual food. Our Divine Savior so loved us that He gave us Himself in the sacrament of the Holy Eucharist; He gave us His own body and blood as food for our souls.